In the wake of Brexit, Aboriginal leaders plan to survey their people on an exit from Canada. Note: the "Abexit" is a made-up premise to look at Indigenous sovereignty and autonomy through the lens of the recent "Brexit" referendum in the UK. The characters are also made up, but the circumstances depicted are very real. Unsatisfied with their treaties and citing irreconcilable differences in values with the broader Canadian economic community, many Indigenous leaders have voiced a will to take steps to leave the half-continent’s crude imperial structure. An Elder from the Winding Windigo area, Mrs. Alliya Waters, declared on Friday that economic uncertainty in world markets was far preferable to the certain death prescribed by Canada’s ongoing industrial extraction in sensitive riparian areas. “An economic uncertainty based on our values and our love for the land will always lean towards conservation and good health; and it will always feed us, clothe us, house us, and let us drink clean water.” The Elder lady made this statement before stepping into a helicopter to view the state of the Alberta tar sands developments. Mrs. Waters fainted when she saw it and since has been hospitalized with what appears to be a massive heart attack. The collapse of Alliya Waters over the weekend has sparked outrage among Indigenous communities whose spiritual, linguistic and cultural identity is connected to the four elements of the northern prairie. The “remain” vote, however, has powerful, resourceful allies. Minister of Oceans, Sir Ivor Salmon Farm, said in an interview that he will rely on Indigenous Peoples choosing a predictable, safe economic situation within Canada’s development plan. There is substantial disagreement between Indigenous leaders who rally behind Indigenous Peoples’ right to self-determination. Surprisingly, one side falls on the “remain” side of the fence – promoting the economic and cultural realizations which recognition of Aboriginal Title by the Supreme Court of Canada will have on their economic and governance prospects, and citing recent rulings finding for Aboriginal Title for the first time in Canadian history. Those parties will strive to demarcate an economically meaningful place for Indigenous Peoples in a united Canada. On the “exit” side, leaders deny the ability of Canada to determine their title, or the nature of their title, and cite recent international court decisions acknowledging the “absence of domestic remedy” to the Indigenous dilemma in Canada. The “remain” vote has already mustered overwhelming support among the elected Indian Act Chiefs and Councils, who receive decent salaries and benefits to administer the world-renowned poverty experienced by First Nations, Metis and Inuit communities in Canada. The administration of poverty provides at least 60% of employment in First Nations communities on average, but, in some case, 95% of all jobs on-reserve are funded by the foreign state system. In contrast, and following from their decisive action of tearing up a 150-year-old treaty with Great Britain in 2013, largely over Canadian fracking plans, one Indigenous People on the east coast is buoyed by the now popular movement to abandon broken treaties and to stop relying on the ongoing spiral of broken and breaking promises for “economic equality” in an anti-nature economy. Another element of the Brexit which landed particularly meaningfully with Indigenous Peoples was control of their borders. Currently, any non-Indigenous person who resides and works in their territory is paying taxes to Canada. 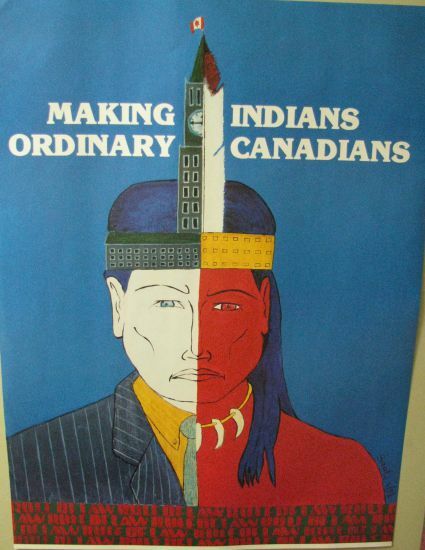 Indigenous leaders would like to see that situation change, and that non-Indigenous citizens living on Native Lands would seek their passport and ID cards from the relevant Indigenous nation, and pay certain taxes to the Indigenous Nation, and enjoy the desired employment, freedoms and responsibilities as offered by the Indigenous Nation. Most settler communities are uneasy with the idea of being made citizens of the Indigenous nations on whose lands they reside and work. Currently, settler communities are free to self-define, and behave as if they have some god-given rights, or Canadian rights, to the lands they occupy, never having recognized the national and international Indigenous reality of Indigenous sovereignty. Young environmental activist Forrest Glenn, and his partner Sea Cove, insist that Indigenous law must supersede Canadian law, if the natural world is to continue at all. This would preclude fracking, extensive use of industrial agricultural pesticides, and clear-cut logging. Enforcement of those laws is a matter which will largely be determined by Abexit votes, from sea to sea to sea. That is, from the Atlantic Ocean to the Arctic Ocean to the Pacific Ocean. While it is unclear that “dispossession” or “joining confederation” was the intended result of any of the treaties made in the 19th century between many Indigenous tribes and Canada, making an “exit” is possibly an inaccurate term for the revitalization of their sovereignty and self-determination in lands they never abandoned nor sold. However, an Abexit is on the horizon, in modern global-market terms. If 100% successful, it is unclear whether Canada will have any lands to stand on; or even any bodies of water to float in. Indigenous title lands in what is now Canada were categorically protected from invasion and molestation by the state’s predecessor, Great Britain, in a number of Royal Decrees. In a marked and illegal departure from that uneasy peace, Canada has occupied and made use of lands in which it never completed treaties with any of the Indigenous Nations west or north of the Rocky Mountains, and it has broken every treaty it made or succeeded to east of that point. That is to say, Canada has never completed treaties which would withstand the scrutiny of international human rights observers, and it has failed to live up to the terms and conditions of every treaty it did make. Unfortunately, lacking an “Article 51”, such as the United Kingdom will use to dispatch itself from the European Union, Indigenous Peoples are expected to lobby in Canada’s next Universal Periodic Review at the United Nations – seeking recommendations of their respective cases to the UN Committee for Decolonization. Under the terms of that Committee’s mandate, which is soon to review the status of the Great Kingdom of Hawaii, the Alaska Native Nations, Puerto Rico and West Papua, decolonization could be reasonably expected to occur within a decade. Pockets is CEO of the Canadian crown company “Animal, Vegetable, Mineral.” The company’s profits last year totaled $2.9 trillion in business on treaty and non-treaty lands. On Friday night, hours after her Abexit press conference, Chief Axehead was reported missing when she did not show up for a family gathering, was not at home or with relatives or friends, and did not reply to calls, texts, facebook messages, tweets or e-mails. The RCMP advised the family that she was “probably out on a drunk,” and that police might take up a search “sometime next week.” Chief Axehead recently celebrated 21 years of drug and alcohol free living.